Shimano Sora Vs 105: Who Will Win The Shimano Showdown? Shimano Sora Vs 105: Who Will Win This Groupset Showdown? It's the Shimano Sora vs 105. Which one comes up trumps? If you're in a hurry and don't have time to read my fantastic guide -the Shimano 105 is far superior. BUT it's much more expensive. Read on to see if you should spend the extra money. 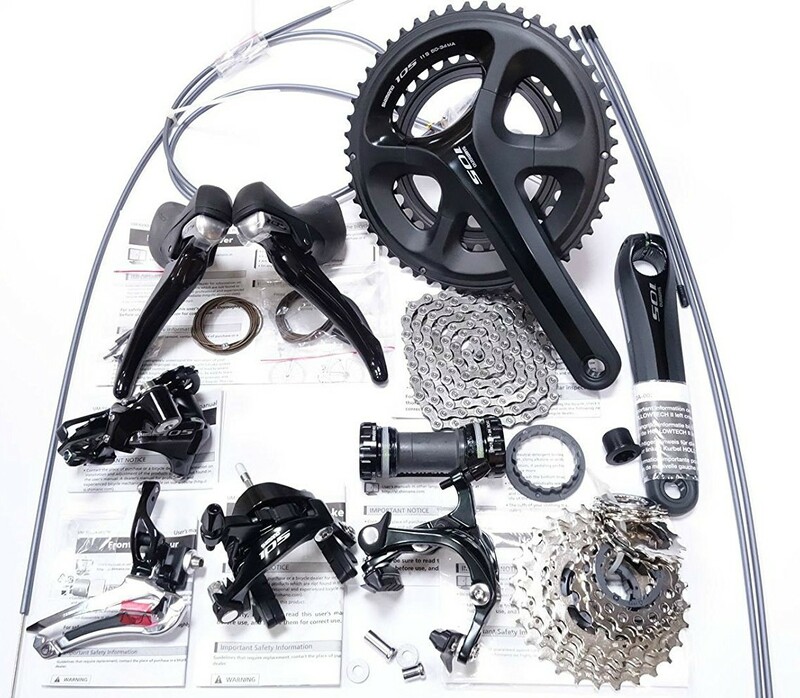 When shopping for or building up a bike, one of the biggest considerations in performance and value is the groupset, the cluster of components making up the drivetrain and braking system. The groupset is made up of the chainrings, cassette, and chain; the front and rear derailleurs; the shifters, cables and brake levers; and the brakes themselves. The major manufacturers each have a hierarchy of systems. Performance and price increase up the line, as materials, design, and configuration options are upgraded. The bottom line is that as you move up the hierarchy, you’ll pay more in exchange for lighter weight and increased strength, smoother performance, more gearing options and improved durability and reliability. Shimano is nearly ubiquitous and has controlled the lion’s share of the market for years, so chances are that your next bike will come equipped with some iteration of this industry leader’s groupsets. So what should you know, and how should you choose? Let’s compare two of Shimano’s most-seen groupsets, the entry-level Sora, and the popular 105, two levels up the quality chain. A double or triple crank and a 9-speed cassette. You can get a good range of speeds- but with a 9-speed cassette, you’ll have bigger jumps between gears. Every component is a little heavier than higher-up models. Added up, they make a significant weight difference. How much this matters is up to you, but it’s true that a lighter bike is a joy to ride. Materials and engineering that perform just fine, but don’t have as much long-term strength and durability. For most riders, this won’t be a huge concern. Perhaps the most obvious difference is gearing: 105 offers 11 speeds on the cassette. This means both a much wider range is possible (easier gears for hills, yes!) and shifting will be smoother with smaller gaps between gears. Pile up the parts, and you’ll be saving significant weight over Sora. Materials overall are stronger, lighter and stiffer, lending better performance and more long-term durability. So, who should ride Sora? Almost anyone, really. The entry-level components from Shimano all perform well. Sora is reliable, strong and smooth. If you ride just for fun and fitness, or to get around, and don’t have too much need for a high-performance machine, Sora is a great choice. The only concerns that I do have relate to gearing. Sora is, for now anyway, a 9-speed mech, and industry trends suggest a movement toward 10 or 11 across the board. Though we’ve gotten by just fine with 9 speeds for many years, I for one have come to appreciate the wider range of possibilities offered by 10- and 11-speed groups. ​Who benefits from upgrading To 105? 105 is my go-to, and it’s likely where I’ll stay. I don’t race, and I don’t need the performance of the fanciest groupsets, but at the same time, I ride pretty far, sometimes pretty fast and occasionally for weeks at a time over mountain ranges. Here’s where 105 is worth the price tag: If you ride a lot and the miles add up, there’s a lot to appreciate. Lighter, stronger materials don’t matter on a grocery run. But over a century ride, you’ll save a bit of energy turning those stiffer cranks, and the umpteenth big hill will go a lot easier on a lighter bike. The increased gearing possibilities are a huge plus. For tours, I can run a very wide range cassette, allowing me to climb big hills with a full load of gear. For fun go-fast rides I can keep an efficient cadence going due to smaller gaps between gears. Especially when touring, I need peace of mind! 105 is made for long-term performance, and I’ve rarely had anything break. This is nice while running errands- but crucial on long tours. Related Post Best Cycling Gloves For Long Rides: Want Feeling Back In Your Fingers? These advantages are where the 105 shines, and that’s why I like it. That said, it’s important to be realistic about your needs. 105 is almost 3 times as expensive as Sora! That’s where the importance of understanding what you’re looking for comes in. If you are going on Saturday cruises, running errands and heading out to the pub, Sora is PLENTY for you. It’ll run smoothly and reliably. The added performance and price of the 105 start to make sense when you’re really putting a lot of time on the bike. Tight, smooth shifting action gets more important in a fast-paced club ride. Stronger materials are more critical when you’re a hundred miles from the nearest bike shop. Greater gearing options are a lifesaver when heading up mountains you wouldn’t go near without lots of riding experience. The key is to use the right tool for the job. The groupset is arguably as important as the frame itself, and often the bike’s frame and intended use will determine what kind of group you’ll want. There’s a reason that entry-level, recreational and commuter-style bikes come equipped with Sora- it works, it’s smooth and reliable, and it performs great for the price. In turn, performance-oriented bikes meant for more serious riding are likely to sport a 105 groupset. They’ll carry price tags to match. There are a number of reviews of all the recent iterations of the Shimano groupsets. The reliable Cycling Weekly gets it right in my mind. The 105 set received a perfect 10 out of 10 score, noting that "it’s hard to find fault at this price." 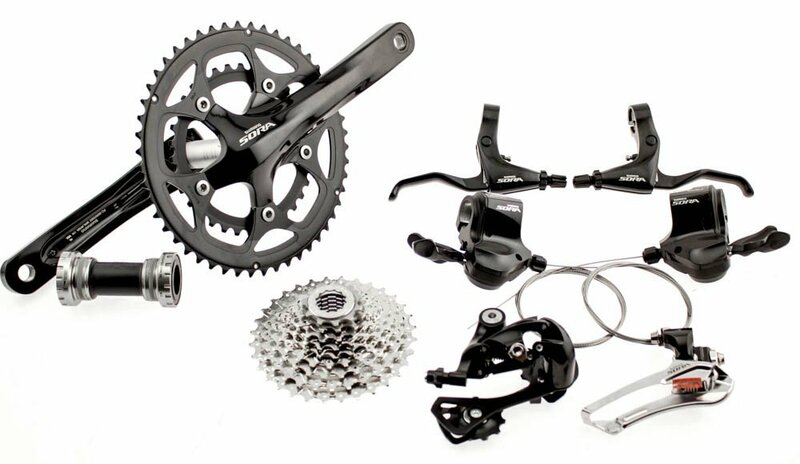 I’d agree that while not cheap, the 105 easily competes with more expensive groupsets even within Shimano’s lineup. The publication gave the Sora a very-respectable 8 out of 10, essentially detracting only for the limits of the 9-speed drivetrain. 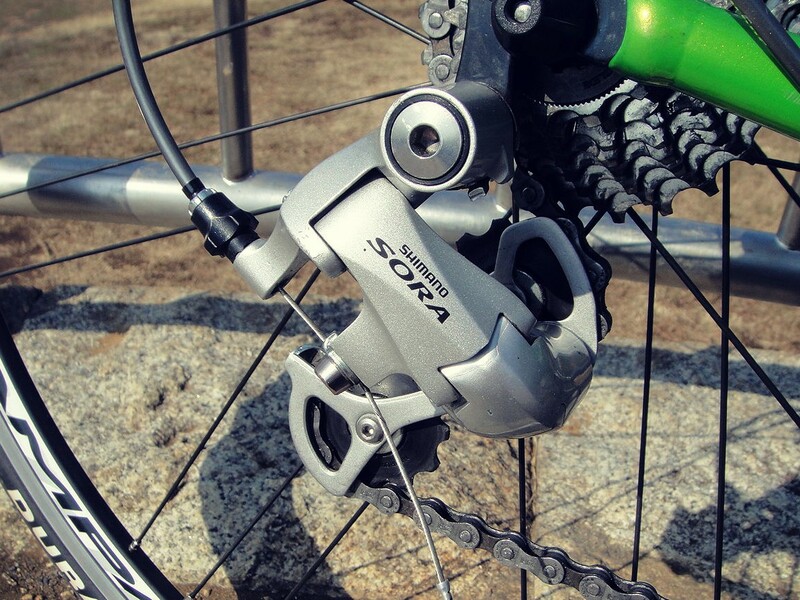 There were a few online commenters in various forums complaining of past experiences with Sora, namely a need for frequent adjustment as derailleurs slipped out of calibration. Others had uninspiring things to say about the brakes. I would temper this, however, as these commenters had used previous versions of the Sora groupset. Current versions are much improved, benefiting from advances that made 105 and higher-end lines great in previous versions as technology trickles down the line. Shimano have remained leaders of the pack over many years for good reason- they offer fantastic products across the price spectrum. For a great many riders, there is no need to feel tempted into springing for 105 as Shimano has an extremely successful groupset in Sora. It’s smooth, reliable and will serve most riders well for many years. But if you’re stepping up the miles, looking to go farther and faster, and you’re willing to shell out for a buttery-smooth and bombproof group to match a nice frame, it is next to impossible to do better than Shimano’s classic 105. Brooks B17 Review: A Timeless Classic, But Is ﻿It﻿ ﻿Any﻿ Good?